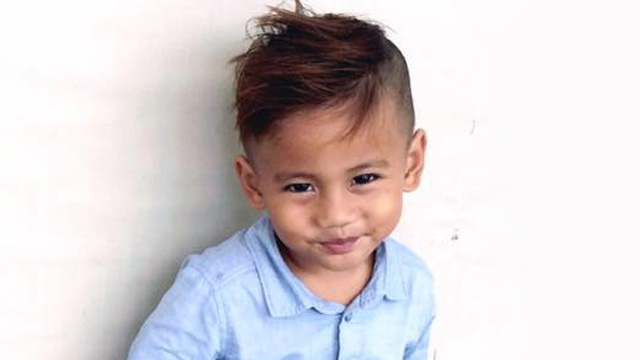 Three-year-old Bladen Skyler Abatayo who was shot dead today. Photo via Facebook. A three-year-old boy was shot dead by a stray bullet during a police drug bust in a Cebu City slum today (Tuesday, July 10). Cebu City Station 5 Commander Senior Inspector John Escober said police received reports of a group of people taking drugs at a slum area in Barangay Ermita. Four police officers were sent to investigate at about 1pm. Two of them approached the location, while two others stayed back in reserve, Escober said. When the police arrived at the house where the alleged drug taking was happening, they reported being met by four suspects “drawing their guns”. The officers immediately drew their own, and shootout ensued. However, other reports claim that two of the suspects tried to grab a gun from one of the officers. None of the suspects were injured during the encounter and they managed to flee the scene. It was at this point, Escober said, that a neighbour arrived and told them a child had been hit in the chest by a bullet from the shooting. He was identified as three-year-old Bladen Skyler Abatayo. The officers took the bleeding boy to Cebu City Medical Center, but he was pronounced dead on arrival. Speaking to Rappler, Escober said the officers were “sure” the bullet that hit the child came from the suspects and not from them. This is yet to be confirmed by a ballistics examination. Escober said he stood by the integrity of his men, saying that they shot it out with the suspects to protect themselves. Abatayo is not the first case of a child killed in the crossfire of an anti-drug operation. As we reported in August, 2016, five-year-old Danica May Garcia was killed by a stray bullet in Dagupan City as she was preparing for school. This what happens the children get shoot while duterte and friends get rich?